When your post is published. Users who follow you will also get an email notification. When a new comment is approved. Users who’ve already commented on the post will also get an email notification. When someone mentions you in a post or a comment. When you re-edit a previously posted comment. Users who’ve commented on the post will also get an email notification. When your level is upgraded or downgraded. 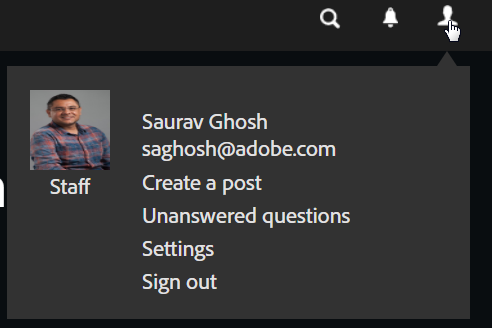 On the top right-hand corner of the page, click User Profile. 3. On the Mail Notifications page, enable or disable an appropriate notification workflow. This update also enhances the search performance in the portal. We’ve integrated a few changes in the background to make the search experience as seamless as possible. The post What’s new and changed in the latest Community Portal update appeared first on eLearning. Captivate (2019 release) Update 1 is now live! We have released Update 1 for the 2019 release of Captivate. This update addresses several important bug and security fixes. To install the update, in Captivate, click Help > Check for Updates. Then, follow the on-screen instructions. Verify that the new build number after the update is 11.0.1.266. In iOS devices, VR content does not display as expected and appears truncated when an LMS launches the content in an iframe. An HTML5 output in an upgraded PowerPoint project appears blank, when the source PPT is in Linked mode. Please update your copy of Captivate (2019 release) and let us know if there any issues. The post Captivate (2019 release) Update 1 is now live! appeared first on eLearning. 1. Upon reaching a level, when do I get my Serial Number? Ans: Once every quarter, after reaching a new level, we mail you the Captivate Serial Number. For Q3 of 2018, we had already sent out the serial number. At Adobe, Q3 is Sep, Oct, and Nov, and so on. The breakdown is shown below. For Q3 we have already sent the Serial Numbers. 2. I do not see any mail from Adobe in my inbox. Ans: As mentioned before, if you have reached a new level, we would’ve sent the Serial Number. 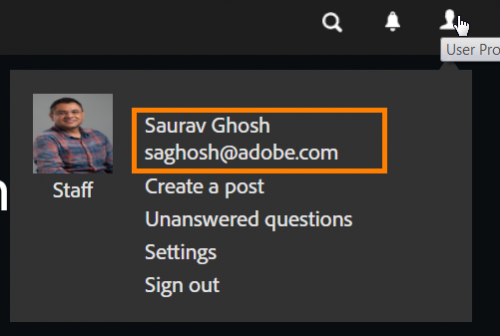 If you do not see any mail from Adobe, please check your Spam folders. Chances are the email will have already reached you in the Spam folder. 3. I’ve checked my inbox and Spam folders multiple times. I still do not see any mail from you. Ans: Reply to this blog and we shall answer. The post Incentives upon reaching levels – What and how appeared first on eLearning. Due to recent changes in Adobe’s data protection policies, we had switched the privacy settings to Private. You can, however, switch it back to the previous state. Setting the name to Public makes your profile name more meaningful, and is easier to share the profile link with your name with prospective clients and employers. 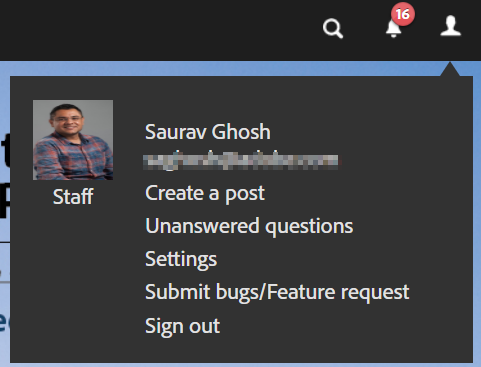 To the right of the page, click User Profile. 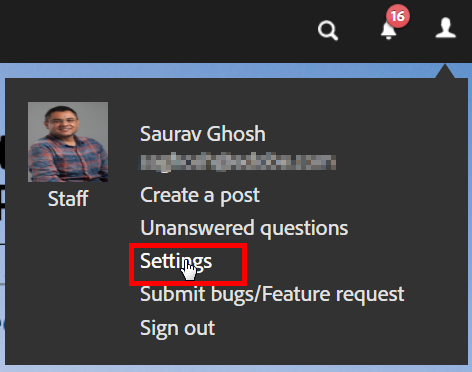 On the menu that appears, click Settings. To change the privacy settings, choose the option Public. After you’ve changed the privacy settings, follow the steps below to change the name of your profile. On your profile drop-down list, click your name. To the bottom-right of the screen, click the button, as shown below. You can now change your profile name and this name will be displayed throughout the portal. 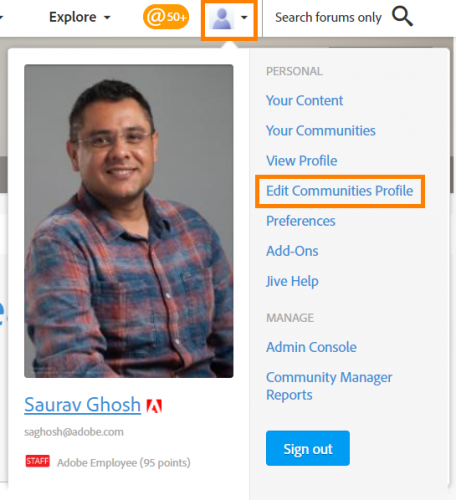 On the page, click your user avatar, and then click Edit Communities Profile. In the Avatar section, click Add another avatar. Choose a photo that you’d like to represent as your avatar. You can then upload the photo and crop it accordingly. After you’ve uploaded your avatar, click Finished. NOTE: It may take a while for your avatar to get approved. The post How do I change my profile name and image? appeared first on eLearning. The post Captivate responsive courses will not auto-play on browsers appeared first on eLearning. We have released Update 1 for the 2017 release of Captivate. This update addresses several important bug fixes and includes support for the latest release of macOS. To install the update, in Captivate, click Help > Updates. Then, follow the on-screen instructions. The new build number after the update is 10.0.1.285. New video tutorials for Captivate (2017 release). Whether you are a rookie user or an experienced user of Adobe Captivate, these tutorials serve as an excellent baseline to get acquainted with Captivate (2017 release). Navigate to video tutorials to get started. Support for macOS 10.13 & iOS 11.2.6. This update supports the latest Mac releases and fixes a critical issue. Read more about it here. Direct access to Captivate e-learning assets without having to sign in. Download assets and files straight away. The post Captivate (2017 release) Update 1 released appeared first on eLearning. And Lieve has made it to the list of winners. This is a fantastic moment for us and the community. The recognition is a testament to Lieve’s contribution, her knowledge, and more importantly, the thousands of users who were benefitted from Lieve’s advice, and still are! Each year, Mindtouch, a customer-success driven SaaS organization, publishes a list of top 100 content experience strategists. Going by the trend, Mindtouch has published a list of top 100 content strategists for 2017. Access the list here and vote. One glance at the list and you will see that our own community members Lieve, Kevin, and Ugur feature in the list. Lieve, aka Lilybiri, needs no introduction. Ask any Captivate user, newbie or seasoned, and he/she will have nothing, but praise and admiration for Lieve. Her blog is a goldmine of anything and everything Captivate. Dr. Ugur Akinci, a technical communicator and information designer, is a seasoned content experience strategist and has worked with Fortune 100 organizations. His blog, again is an exhaustive repository of videos, tips and tricks, and career advice for technical communicators. Kevin Siegel, author and instructor, is the founder of IconLogic Inc. He is a certified technical trainer, has been a classroom instructor for more than 15 years, and is a frequent speaker at trade shows and conventions. At Adobe, we are grateful to Lieve, Kevin, and Ugur for their time and contribution to the Adobe eLearning Community portal. We hope nothing but the best for them and wish them more accolades for the future. To vote, visit http://bit.ly/2x3ZFp5. The poll closes soon, so please hurry! Adding closed captions to your eLearning courses is a basic requirement to meet accessibility standards like Section 508 and Web Content Accessibility Guidelines 2.0. You can easily do so for your audio-based courses by adding narration to your screen, adding slide notes, and then converting those slide notes to closed captions. But a little-known fact is that you can have closed captions for slide videos as well. Watch this short tutorial to learn how to associate close captions with your videos embedded in Adobe Captivate courses. To add a slide video, click Video > Insert Video. 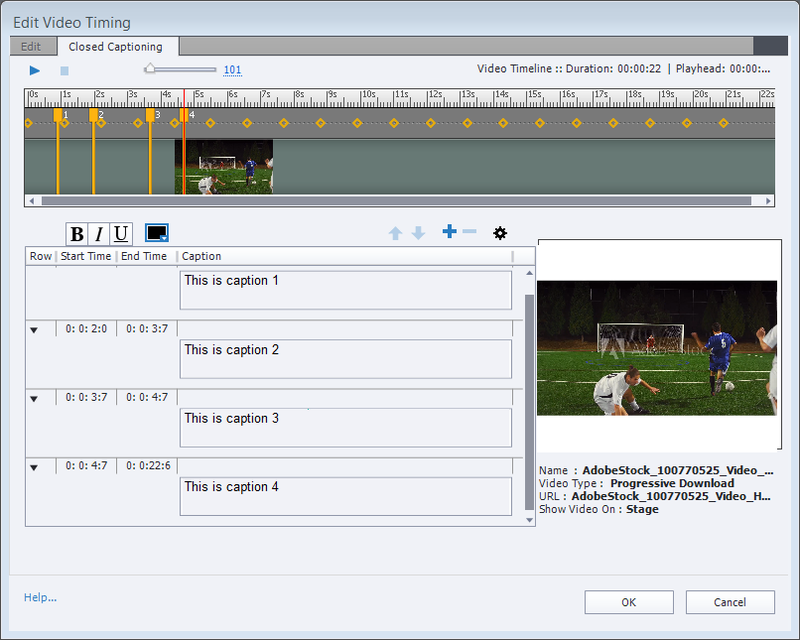 Add a Multi-Slide Synchronized Video and click OK.
Click Video > Edit Video Timing. Click the Closed Captioning tab. Place the cursor at the position where you want to add CC. Click the + sign and enter the Closed Caption text. 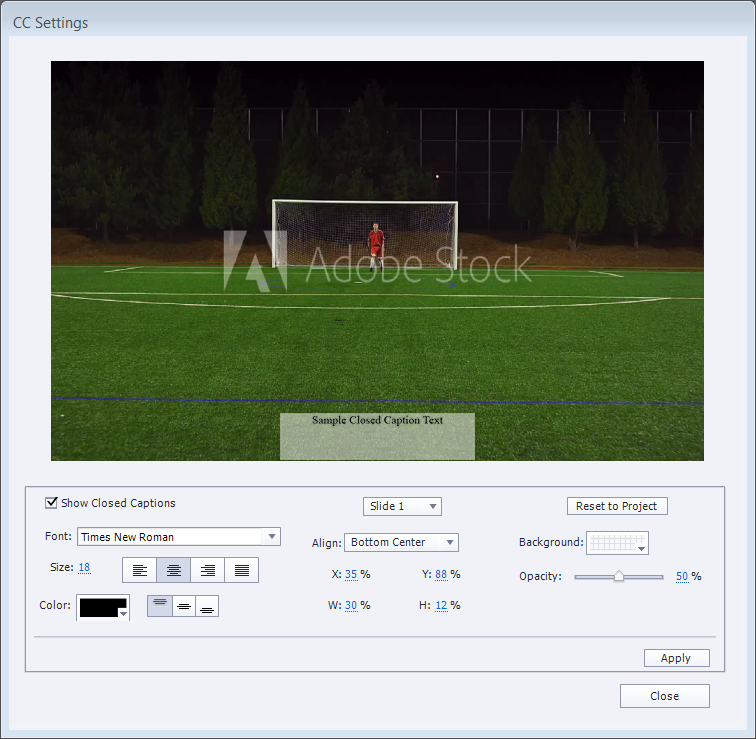 Click CC Settings to change the font, size, color, background, and the number of lines in which the captions must be displayed. To enable the display of closed captions in the published projects, select Show Closed Captions. The ‘CC’ button appears in the playbar. While playing or previewing the project, click the ‘CC’ button to view the closed captions. For more information on customizing the captions, read the blog Using the Customizable closed captions feature. Leave a comment here to let me know if you have any questions about this workflow or need tutorials for any other feature in Adobe Captivate and/or Adobe Presenter. In this blog post, you will learn how to easily convert your PowerPoint slides into interactive and engaging web-enabled presentations using HTML5. If you do not have the 2017 release of Adobe Captivate, download a trial version of Captivate. To install Captivate, follow the installation instructions here. Open the presentation that you want to convert into an eLearning course. Make the required changes and remove all unwanted slides from the presentation. Open Adobe Captivate. If you are on a Mac, you’ll find your installed version of Captivate under Applications. If you are on a Windows computer, you’ll find it under the Start Menu. 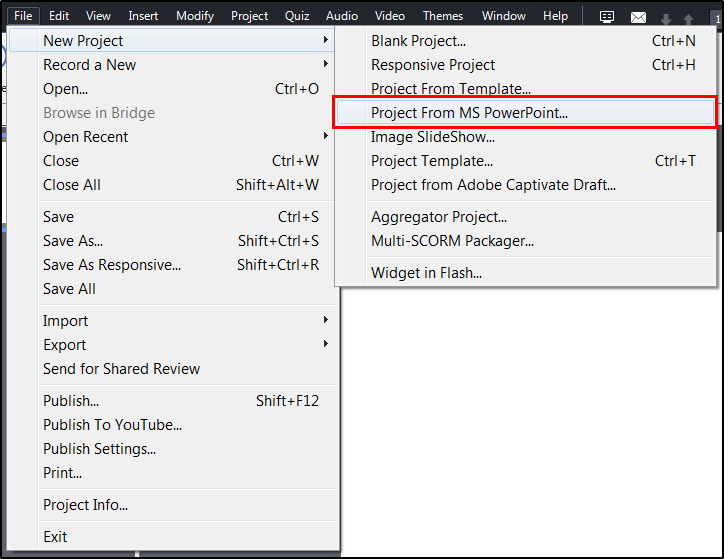 To import the PPT, click File > New Project > Project from MS PowerPoint. 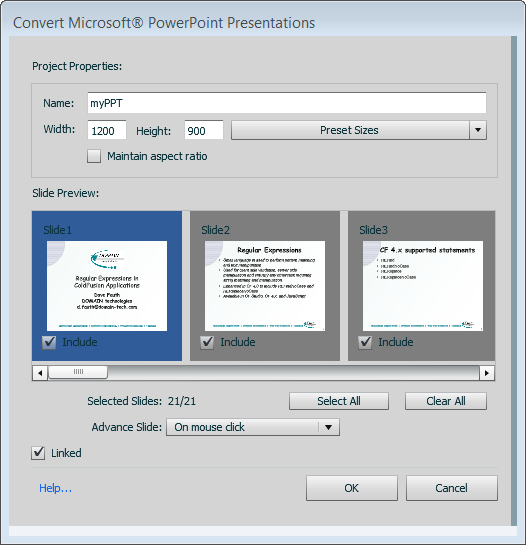 The dialog box Convert Microsoft PowerPoint Presentation appears. Enter the project name and the size of the project in project properties. Select all slides and click OK to continue importing and converting your slide deck. Choose the option Publish on the big button bar. In the Publish dialog, select the SWF/HTML5 tab (top left). 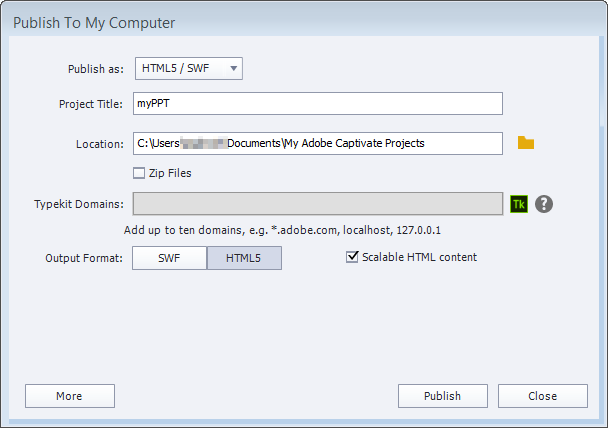 Then set the output format to HTML5 (you can turn off SWF.) Finally, click Publish. To put your new web slide show online you’ll want to copy the folder with your converted PowerPoint deck into your web server. 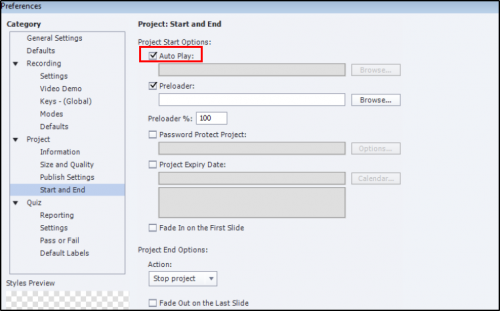 By Default, Captivate publishes files into a folder called ‘My Adobe Captivate Projects’ in your Documents folder.